Foggy puts best footstool forward! 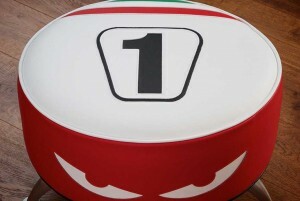 Carl Fogarty is swapping footpegs for footstools with the launch of an official Foggy footstool as part of Vintage 60’s Motoring Legends Collection. The footstool design is based on Carl’s 1999 World Superbike title-winning bike and is hand-made in the UK from Italian leather. It measures 46cm diameter by 34cm overall height and features the trademark Foggy Eyes logo.